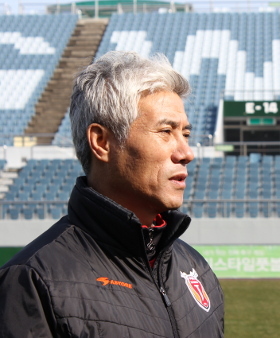 Jeju United’s coach Park Kyung-hoon, 53, announced he is leaving the club on Wednesday for personal and health reasons. Park joined in 2009 and was named manager of the year after leading the club to second in 2010, his first full year in charge. That year he signed a five-year extension on his contract which was due to run until 2015. Park told team president Jang Seok-soo he would be returning to teach at Jeonju University in North Jeolla Province, where he has worked previously. He also coached Korea's under-17 national team from 2004 to 2007. The K-League Classic season finished on Saturday and Park led Jeju to fifth place overall. Park announced on the club website: "It has been an unforgettable five years with Jeju … I have stepped down as manager but anytime Jeju needs me I will be there." A successor has not yet been named.